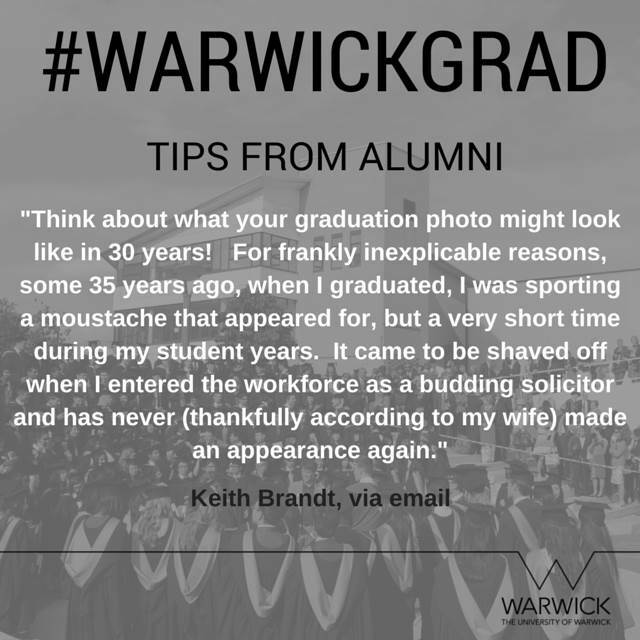 That hashtag was #warwickgrad – it’s one we’ve used for a few years at graduation, is easy to remember and doesn’t tie us to a particular year, so there was no need to tinker with it. That said, just because we’ve used it for a few years doesn’t mean we didn’t need to tell people about it – there’s nothing worse than no-one else using your official hashtag is there? We made the effort ahead of our week of ceremonies – the hashtag was tweeted about (obvs), was included on our Intranet pages about graduation and we contacted our internal network of digital champions to remind them of it. Then, during the week itself, it was featured in all the graduation materials students received. Hashtag suitably communicated, we also made sure we had enough staff around to post content. We were incredibly fortunate to be able to call on four brilliant members of the digital marketing team to man our social media channels for all six days of our graduation ceremonies, and they did a wonderful job pushing stuff out, sharing posts from our students and departments and joining in conversations. There were 1,366 tweets posted to #warwickgrad during graduation week. These tweets earned 12,402,154 impressions and the tag was trending in Coventry during the week. 12.4 million impressions…that’s quite a lot! A quick look back at other things we’ve worked on this year underlined just what a large number it was. Our coverage of our winter degree ceremonies in January, using the same hashtag, generated 2.3m – it should be pointed out that in winter there are only half the amount of ceremonies as in summer, but still, our impression way more than doubled. Another useful comparison was one of our biggest announcements of the year – the news that we are planning to build a campus in California. This announcement on Twitter generated around 850,000 impressions. Going a step further, we looked at what 12.4 million impressions might compare to in the offline world. While there are no exact twins, we thought live TV viewing figures was a good start, so we started there. The week before graduation around 6.4 million people watched each episode of EastEnders, while around 6 million people watched each episode of Coronation Street. We hit 12.4 million – we had more eyes on our graduation coverage than were watching the two most popular soaps in the country. Wow. So, what caused such a spike this time? Well, as much as anything, it was getting buy-in from our departmental accounts and tweeting staff members to start using the hashtag early on and entering into the spirit of the week. Just as the central did an amazing job throughout the week, so did our departments – if ever we needed justification for sharing the sweets and using the central team to help make things happen, rather than control the whole shebang, this was it. Our departments and colleagues totally nailed it – just look at the academics from our History department in their silly hats! Of course, the incredible reach of our hashtag was also helped massively by our students using it. They added their voice (and usually pictures too), we could retweet it and wish them all the best and it was all ace. Even better, our alumni picked up the hashtag and shared their memories on it (more on alumni later). One other note on Twitter, remember how we did all of our video on mobile this time and how we weren’t too worried about it? Well, we were right – our top 10 tweets from the week were all videos (ranging from quick student interviews to slow-mo mortarboard tosses) and the engagement rate on these tweets was through the roof compared to our usual content. This video with one of our newest grads pretty much summed up the whole thing. 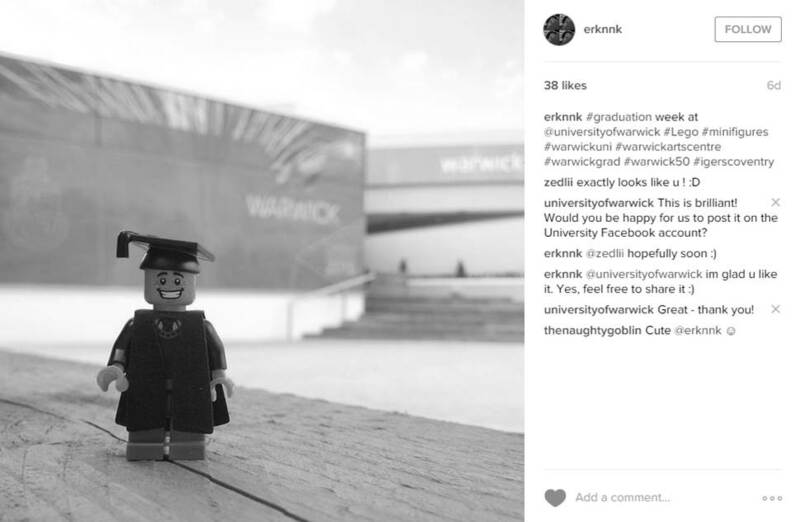 The #warwickgrad hashtag travelled well on Instagram too – we saw 180 posts over the week, including 23 from the University. Our content earned 3,480 likes – about five times what we get in a normal week. We also saw lots of student involvement on Instagram, and had great fun watching their images come flooding in. We even reposted some of them (with the permission of the original poster) including this one of a Lego man in his finest grad gear. 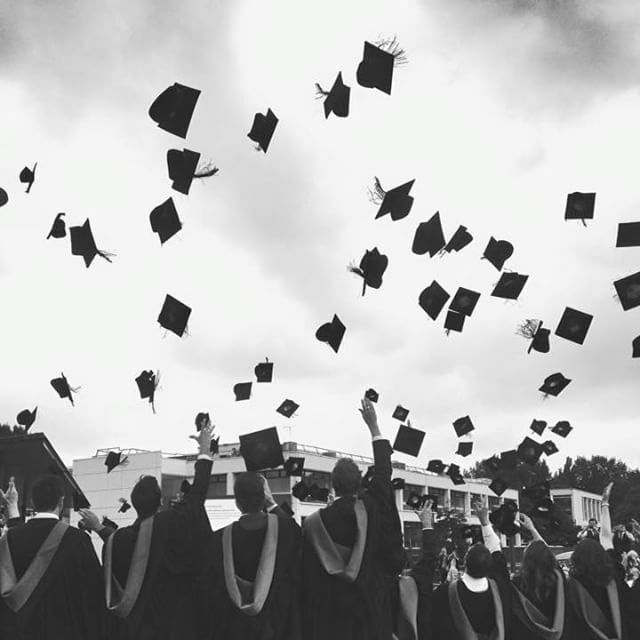 Our graduation content even managed to pierce Facebook’s algorithm and do well for us – our content reached 619,574 accounts and 89,032 people engaged with us (for comparison, we only have around 61,000 followers on Facebook). Video and images were, unsurprisingly, the best performers on Facebook – our slow-mo clip of mortarboards being chucked in the air reached an incredible 15,440 people. That’s compared to around 1,500 per video for the pro-shot stuff we did last year. Something as busy and exciting as graduation has proved a great time for us to dabble with new toys – last year, we really found our Instagram groove during our degree ceremonies, and this year we gave Periscope a go. In short, it worked and we’re definitely keen to explore it more. If you’re interested, there’s a video of one of our ‘scopes' here – I had to play it on one phone and film it on another as you can’t capture the comments and likes if you save a ‘scope, but hopefully it gives you an idea. We made very little noise about Periscope, so next time we use it we’ll definitely do more shouting about it. One final thing to mention was how we reached out to our alumni community and gave them a role in graduation. A few weeks before the ceremonies we asked them – via email and social media – to share their top graduation tips with us. We then turned these into shareable graphics and posted them throughout the week across the main University accounts and the alumni ones too. They looked great, went down well and gave alumni a special role, which was fabulous. Here’s an example of a couple of them (converted to black and white for comms2point0, of course), offering some excellent advice about what to wear, the day itself and, erm, facial hair. Getting strong departmental support for a centre-led campaign has a significant impact on its reach and visibility, and helps generate a real buzz online. Video works brilliantly on Twitter and Facebook and doesn’t need to be professionally shot or put into a YouTube montage. Mobile phones perform very well. For the central accounts, this kind of coverage would not have been possible without the brilliant work of our 4 online communications officers, who were based at the ceremonies throughout the week. If you’ve got a special audience such as alumni, give them their own role and get them involved – they will be more than willing. Dave Musson is a Senior Online Communications Officer at the University of Warwick, leading on social media.